Chocolate is the product of a long, complicated refining process that begins with the bean pods of the Theobroma cacao tree. Theobroma cacao means “food of the Gods,” and this name reflects both the heavenly taste of chocolate and the reverence Mayan and Aztec cultures had for this divine food. These native American civilizations were the first to recognize the value of the cacao bean, using the pods as currency and serving the grainy crushed beans as a drink among the upper classes. The original bitter chocolate drink favored by Mayans and Aztecs is very different from our smooth, sweet chocolate bars today, yet the source of both remains the same: the humble cacao bean. The cacao tree is a tropical plant that grows only within 20 degrees latitude of the Equator. The main cacao-producing countries are the Ivory Coast and Ghana, although there are numerous smaller markets in South America and Africa. The cacao tree produces pods all year long, so a typical tree would have pods in every stage of ripeness, from the earliest flowering bud to the most mature pod ready to be harvested. There are three types of cacao trees: the Forastero, the most common and robust variety with the least remarkable flavor, the Criollo, the most delicate and rare tree, with a heavily perfumed fruit, and the Trinitario, a hybrid between the Forastero and the Criollo that displays characteristics of both trees, having an average yield of moderately aromatic beans. Chocolate begins with the harvest of the cacao pods. Because the pods grow in all degrees of ripeness and at any location on the tree, most harvesting is done by hand with machetes. Two important steps must happen before the cacao can be packaged and shipped to the manufacturer. First, the pods are split open to reveal the cocoa beans instead, surrounded by the fruity pulp of the pod. This pulp is sometimes used to make drinks or desserts, as it has a pleasant fruity taste with subtle chocolate flavor. The beans and pulp are scraped from the pods and left to ferment in baskets for two to eight days. This step is crucial, as the fermentation process mellows the flavor of the beans and imparts the fruity undertones of the pulp. Without fermentation, the beans would be too astringent and bitter to enjoy. Many high-quality chocolates undergo a long fermentation process, which can be tasted in the floral, fruity notes of the final product. After fermentation, the beans are spread in a single layer and left to dry completely, usually in direct sunlight. It is only after the beans are fully fermented and dried that they are packaged and shipped to chocolate manufacturers around the world. After the beans arrive at the manufacturing facility, they are roasted to bring out the most intense chocolate flavors and colors. The time and temperature of the roasting depends on the type of beans and their relative moisture levels. After roasting, the beans are transferred to a winnower that removes the shells of the beans and leaves the “nibs”—the essence of the cocoa bean that’s full of cocoa solids and cocoa butter. The nibs are ground to a thick, rich paste called chocolate liquor (a misleading term, since the product, contains no alcohol). This liquor is the foundation for all chocolate products, and at last, begins to resemble and smell like conventional chocolate. The liquor is pressed to remove the cocoa butter, which leaves a powdery disc known as “cocoa presscake.” Presscake, when pulverized, becomes common cocoa powder. 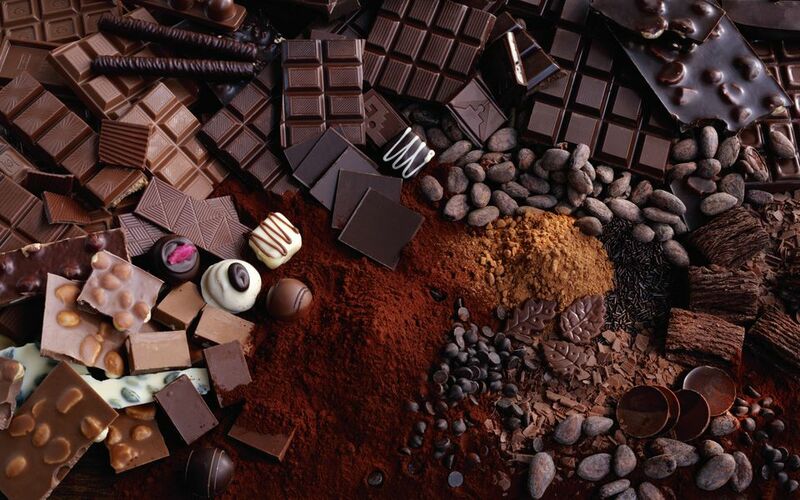 At this point, the chocolate process differs depending on the recipe and formulation of the manufacturer. If the chocolate is low quality, the pulverized presscake will be mixed with vegetable fats, sugar, and flavorings to become substandard chocolate. If the chocolate is going to be higher quality, cocoa butter will be re-added to the chocolate liquor, along with other ingredients like sugar, vanilla, and milk. White chocolate undergoes a similar process, except it does not contain chocolate liquor or cocoa powder. The newly mixed chocolate travels through a series of rollers to smooth out the texture before traveling to the conching machine. Conching is the final step in determining the ultimate flavor and texture of the chocolate. The conching machine, so-called because the original designs resembled seashells, kneads and massages the chocolate mixture for a period of time ranging from several hours to several days. The speed, temperature, and length of the conching process determines the final texture and flavor of the chocolate, as conching smooths the chocolate and mellows any remaining acidic tones. After conching, the chocolate is tempered in large machines that cool the chocolate to precise temperatures to produce shiny, smooth bars. Finally, the chocolate is poured into molds, wrapped, and ready for shipping to eager consumers around the world.